Pleading the Sixth: In these days of political strife and partisan antagonism, it is encouraging to see that government can still work and reach consensus for the benefit of the people, as demonstrated by the near unanimous passage of a comprehensive indigent defense reform bill in Utah. Here the 6AC explains the historical underpinnings of Utah’s courts that give us optimism for the right to counsel in Utah and offers lessons for achieving the best paradigm of justice everywhere. Part I of this report explains the new reforms and the consensus approach from which other states can learn. Every jurisdiction in America has its own criminal justice system and court culture that is the result of a multitude of decisions made by countless policymakers and criminal justice stakeholders over many decades and often centuries. Utah is no exception, but its historical roots are particularly unique. This underlying history prompts Utahns to strive always to find consensus, while elsewhere throughout our nation today we seem to focus on our disagreements and the ways we are divided. 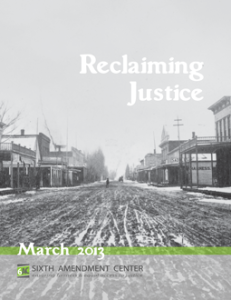 From the earliest days of the people living in the Utah territory, its courts focused on protecting the community by finding ways to restore and reconcile offenders to that community, in contrast with the punitive and retributive focus of the courts in many places both then and now. There are failings in Utah’s court system today, to be sure. Too often, actual and constructive denials of counsel in our nation’s state courts can be traced to an institutional racism that lingers from court policies set in generations past. That explanation does not hold up in Utah, though, where the overwhelming majority of people being underrepresented are white people of insufficient means. Moreover, the lack of adversarial representation that can be observed in some rural justice courts in Utah seemingly is not caused by any malicious intent, historical or otherwise. Indeed, the opposite appears to be true, as the majority of criminal justice stakeholders in these rural courts give the impression of having a genuine concern for and respect toward the indigent accused. A review of Utah’s history shows that the lack of true advocacy for the indigent accused in some rural justice courts can be explained in part as a vestige of decisions made by Utah’s pioneers. As an insular religious community that had suffered extensive persecution, in its earliest days the Utah settlers aimed to protect the whole of their religious community against outside influence and sectarian interference. They established church courts that presided over the affairs of their community. When a community member ran afoul of the communities’ ways, the church courts sought to resolve the discord within the community by returning the person to right thinking and reconciling that person to the religious community they were a part of. These church courts had little if any need of an adversarial system of justice because they were not concerned so much with whether a person was guilty or innocent of breaking a secular law as they were with whether the community was disrupted by a community member violating the beliefs of their own community. The early church courts are the most direct ancestors of Utah’s modern rural justice courts, and an unintended inheritance of antithesis to the adversarial system of justice still inadvertently lingers there. Utah’s determination to achieve consensus gave rise to the indigent defense reforms it has just passed here in 2016. This legislation is a strong first step toward Utah committing to ensure the right to counsel for every person in all of its courts, that protects the innocent against wrongful prosecution and provides fairness for every defendant through the adversarial system of justice. Utah’s longstanding restorative approach to dealing with offenders, when laid upon improvements built through consensus and a strong right to counsel, may lead to a new paradigm of justice for Utahns that can be a model for the nation. The Latter-Day Saints sought refuge from religious bigotry together as a collective, with the first Mormon settlers arriving in 1847 in the land that would become Utah. The goal of the Mormon community was nothing less than to build a new Zion – a literal heaven here on earth. In the earliest days on the Salt Lake Flats then, there was really no need for lawyers at all, because conflict is the very antithesis of an earthly heaven. To the extent that there was a need for dispute resolution, the Mormons’ church courts took care of conflict from a uniquely communal vantage with church lay officials deciding the fate of accused persons. Outcomes were based on the common good of both the offender and the greater Mormon community. This approach to justice was more rehabilitative in nature, and less retributive or punitive. The church courts were concerned with the offender and not the offense, discarding questions of guilt and innocence inherent in the adversarial process. The proceedings reflected the belief that all people are born innocent but must be nurtured into developing their potential goodness while concurrently being taught to resist temptation. Some wayward members of the flock just needed stronger guidance from the community than others. The LDS community, through the vehicle of the church courts, acted much as a parent toward the offender – sometimes scolding, sometimes threatening, and sometimes encouraging – but always with both the best interest of the offender and the health of the community as the ultimate aim. If the efforts of the church courts and the community failed to restore a single wrong doer to accord with the community, the one would sometimes have to be excommunicated, banished from the Mormon religious community into the outside world, in order to protect the whole. Meanwhile, during the late 1840s and early 1850s, thousands of other people headed west in search of the financial stability seemingly promised by the numerous precious metal mines and expansive ranch lands they read or were told about by the media of the day. The end of the Civil War in 1865 sent others flocking to the west. Particularly from the south, where lands and homes were burned during the war, both former slaves and former slave owners sought the material promises the west offered. Former Union and Rebel soldiers alike also moved to the west. All of these desperate individuals encountered equally desperate people of Mexican descent who still felt the western territories were rightly theirs and native peoples who had their own indigenous claims on the land. In short, no one trusted anyone in the Wild West, giving rise to gunfights, lynchings, and vigilante committees. In this dangerous environment of suspicion, antagonism, and antipathy, the need for an agreed upon rule of law was dire, and everyone wanted a lawyer to protect their own due process rights from the others. It should not be surprising that the right to counsel as we know it today first took root in the American west. In fact, it was the state of Nevada in 1877 that was the first to require not only the appointment of counsel in all cases (felonies and misdemeanors) but also the payment of counsel for services rendered. Other western states soon followed with right to counsel statutes of their own, including Montana, Idaho, and Wyoming, long before the 1963 case of Gideon v. Wainwright required all states to appoint counsel to accused felons. Before the western territories became states and developed the predecessors of today’s state court systems, though, the U.S. Congress set up territorial governments and court systems. In September 1850, the U.S. Congress passed “An Act to Establish a Territorial Government for Utah” (9 Stat. 453). The Act created a territorial court system consisting of a Supreme Court, district courts with general jurisdiction, and justice of the peace courts with limited jurisdiction. Those elected to the new legislature of the Utah Territory were predominantly members of the Mormon faith who deeply desired to maintain church-based control of the courts and to protect their religious community, so that legislature quickly created local probate courts with locally elected judges, effectively displacing the federally appointed courts. In response, the U.S. Congress eventually stripped the legislatively created probate courts of jurisdiction over criminal and civil cases through the Poland Act (18 Stat. 253) of 1874. Yet members of the Mormon community nonetheless continued to primarily rely on their own church courts to resolve most matters among members of the community. The result was that only the most serious cases (e.g., murder) or crimes committed by non-LDS members were handled in the territorial district courts relying on the adversarial system of justice. Less serious accusations and offenses charging LDS members continued to be dealt with by the church courts, with their emphasis on restoring the offender to the community in non-adversarial proceedings. Then statehood came to Utah. The federal “Enabling Legislation” of 1894 required that the Church be made officially separate from the State. This included, of course, the need to create new secular state and local courts that would mete out justice to all of Utah’s citizens, both Mormon and non-Mormon alike, using the adversarial system then predominant in all American courts. The people of Utah adopted the Constitution of 1896, article VIII of which established the court system. The State of Utah’s district courts had general jurisdiction over all civil and criminal matters and were courts of record with judges who were members of the bar. Local justice courts had only limited jurisdiction, including low value civil matters and less serious misdemeanors taking place within the geographic limits of the locality. These justice courts were not courts of record and the judges presiding over them were not required to be and frequently were not lawyers. The transition to the adversarial system of justice for Utahns, with its concomitant right of counsel for the accused, was not a quick and easy one. Because the proceedings in the district courts were more serious in nature, there was a greater tendency for the accused to seek appellate review of dispositions in Utah’s higher courts and also in the federal courts. Having this outside oversight sped up the transition to an adversarial approach to justice in the district courts. But, because the decisions of the courts closest to the people – the justice courts overseeing less serious misdemeanors – are much more localized and undergo far less appellate review, the march toward an adversarial process was naturally longer and slower. And in those regions of the state where the population is less diverse and more remote (i.e., non-urban), the journey to a fully realized adversarial process is still incomplete. To be clear, there is much to like in the community centered and restorative approach to justice taken by the early LDS church courts. Too much of American criminal justice is simply about retribution. There is also a wrong-headed general acceptance in far too many state courts across our country that people accused of crime are worthless and can never learn to become productive citizens. That Utah’s original approach to justice is based on the power of rehabilitation is admirable. The best criminal justice systems in America today are the ones that uphold the constitutional right to counsel and infuse true advocacy into the goal of restoring every individual to the community. Though a defense lawyer is ethically bound to advocate for the stated interests of the client, this ethical duty does not preclude the attorney from helping that client make good decisions about how best to achieve the aims the client wants. This includes advising the accused about the law, how the court process works, and rehabilitative options and resources. Indeed, giving every defendant a true advocate helps the entire criminal court process find the right tools to aid an offender in their own rehabilitation. Some public defender systems bring together an entire team of defense advocates to ferret out all of the social issues that resulted in the defendant encountering the criminal justice system. Such defense teams can include staff psychiatrists, social workers, community liaisons, and lawyers specializing in things like housing and immigration and education, in addition to the actual trial lawyers. In what is commonly referred to as holistic representation, the members of the defense team all work together on behalf of the defendant to deal with the specific charge, but perhaps more importantly to set up the defendant for future success as a law-abiding citizen. Defenders have a unique relationship with the accused and, if afforded sufficient time to develop trust, the defender can uncover many issues facing the accused client that led to the violation to begin with and that can inform a better criminal justice resolution for the individual client and for the community to which that client belongs. Utah’s inherent culture, of striving for consensus and of protecting the whole community by finding ways to restore and reconcile offenders to that community, is firmly derived from its history. Other states should look to Utah to learn how to achieve consensus and implement rehabilitation and reconciliation. 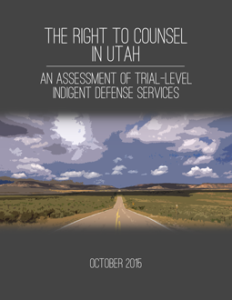 If Utah will steadfastly continue down the path it set in place with the indigent defense reform legislation passed this month, toward establishing a truly effective right to counsel for all defendants, both rich and poor, in all of its courts, it is well-positioned to create a far better paradigm for justice than that presently available in most of America’s courts. Click here for Part I of this report.